, by Don Chapman (including Dads translation for people who dont understand pidgin plus many additional items). Profile of Dad on the Mariner Software Website (www.marinersoftware.com), June  July 2003. Mariner makes a great word processor and spreadsheet that Dads been using for many years. See how he makes use of Mariner to clean up articles grabbed off the Web. Some of Dads work was included in the book Images of CAD: The Art of Computer-Aided Design, published by Nemetschek, makers of VectorWorks, a professional CAD application. Click on the book cover below to learn more. This website was inspired by seeing you at Kevin Kashiwaharas wedding. I thought I would get things started by posting some old, old pictures on our Family Website. I add new pictures and text when I have the time so keep checking back often. Its organized from Naomis viewpoint, i.e., it goes back through her parents, through their parents, and then backwards and forward from there. At Punchbowl (National Memorial Cemetary of the Pacific) visiting Uncle Willys grave. Carol, Ojichan, Michael, Grandpa, Mary, Obachan, Grandma. Uncle Susumu with Karen, Dad and Gordon. 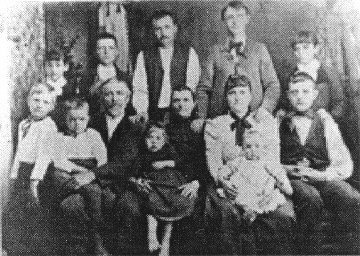 I welcome contributions to the Family Website, photos or stories. Please send them to me at telescapes earthlink.net so that we can share them with the rest of our family and friends. Please type the email address in manually; I removed the live link so that Webcrawlers which are currently out there will not be able to grab the address to send SPAM (junk mail, not the canned meat product popular in Hawaii) or viruses to me. Sorry for the inconvenience. If you have access to a scanner or a digital camera, you can send me digital photos by email. I am limiting the size of the pictures to 5 inches maximum dimension so that people with small monitors or WebTV like my folks can view the whole image. The resolution of the scans should be 72 dpi and I can use JPEG or GIF images. You can send me caption information or stories pasted into an email message, or attached as a text file or word-processing document. If you dont have digitized photos you can always send me copies of pictures by regular mail (email me for the mailing address) and I will scan them and return them to you. 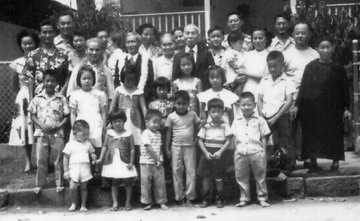 Ojichan and Sakamoto family at a party at Grandma and Grandpas house in Kuliouou. The picture was probably taken by Grandpa using his Rolleiflex and large flashbulb attachment, which Dad still has stored somewhere in his closet. 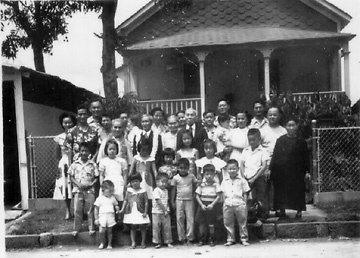 The photo was taken before Aunty Carols bedroom and the extension to the living room were built; the doorway to the kitchen is in the corner. Dads plastic ship models are on display on the shelf next to the doorway. Thanks to Margaret (Peggy Nakamura) Wesley for sending me a scan of the photo above. Shes been very busy scanning old family pictures from her grandmother (Aunty Margaret) and her parents to archive. 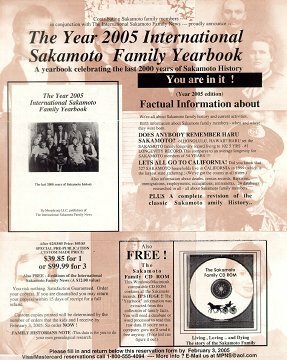 The sample cover photo, unfortunately, must be of an extremely distant German branch of the Sakamoto family, which didnt go very far in persuading Dad to buy the book. Were pretty sure that this refers to Obachan, so Dad plans to keep the flier (but not spend the money on the Yearbook).